Breakfast, as it name implies-breaking the fast, forms the most important meal of the day. A healthy and filling breakfast is absolutely essential to fuel one up with enough energy to do the daily activities. Studies have shown a direct relationship between having breakfast, learning ability, attention span and general well being. 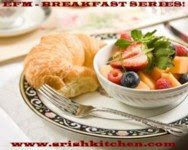 Also many studies have shown that people who eat breakfast can easily lose weight compared to those who skip the meal. Knowing well the innumerable benefits of a well balanced breakfast, at home, right from my childhood days great emphasis was given to it and I wasn't even allowed to leave to school without having breakfast irrespective of whether I had time for it or not! Breakfast preparations at home sometimes started the day before especially when the batter for some item had to be fermented. Since my mom had to prepare breakfast quickly so that it would be ready before I left for school she had few recipes in handy that required minimum time and effort. I have mentioned one of her recipes here-Potato Stew. I have slightly modified her recipe to suit my taste. This Potato stew is similar to Kerala Potato Stew or Eshtu with slight differences in the ingredients that imparts enough spiciness and rich creamy texture to the gravy. Moreover the entire dish is prepared using pressure cooking technique with little time needed for stove top cooking. So dump all your ingredients into the cooker, relax and let the cooker do its job! Dry roast the spices mentioned above(under dry roast) in a pan at medium heat until the colour slightly changes and you get the fresh aroma of roasted spices. Remove from heat, cool and grind to a powder without adding water. Keep aside. Add all the ingredients mentioned under pressure cooking except water, in a pressure cooker along with the ground roasted spices and mix thoroughly. Add water and pressure cook till potatoes are cooked well. I followed this technique of pressure cooking- cook at high heat till one whistle is heard, reduce heat to simmer and cook for about 12 minutes. Open the cooker only when the pressure has been released. Grind grated coconut to a smooth paste adding enough water. Keep aside. Instead of grated coconut you may add 1 cup of thick coconut milk. Since I prefer the thick texture imparted to the gravy by grated coconut I have used it here. Heat coconut oil in a pan and splutter mustard seeds. Add curry leaves and broken dry red chillies. Saute till curry leaves turn crisp and you get the aroma. Do not allow it to burn. Add the pressure cooked ingredients and ground coconut. Check salt at this stage. Reduce heat and cook till the gravy turns thick. During this cooking process you may add additional water if you wish to. When the gravy has attained a creamy consistency remove from heat. Serve hot with Appam/ Chapatis/ Idiappam. South Indies-A series on South Indian Cuisine by Deesha. Wow,that stew looks so yummy and colorful. I luv potatoes. I can almost taste it with nice fluffy appams-my ideal breakfast dish(so long as someone makes it for me)!! Thanks Sweta :) I too prefer someone else making for me and I sitting n enjoying! How I cherish those childhood days! This stew with all spices,is totally new to me..really liked it...will definitely try this out..
Wow potato stew looks fabulous Pooja!! Hai pooja nice curry.Hey how u got ur recipes back.I searched in my dashboard.When i open ur site it is closing the page so i left the msg in my blog dear.Anyway now i can see ur recipes dear. Thanks a lot Vineela! The problem was with the customized feed that I created using feedburner to let readers subscribe. The google reader then took this feed instead of the defualt one. But the feed that I created overflowed and hence stopped indexing and hence my updates were no longer visible! Thanks HCOF! Yes I too ponder about it always!! yummy stew pooja..moms recipes are always special..